The joint venture is a commercial enterprise in which two or more companies join their forces to gain a tactical and strategic edge in the market. Companies consider the joint venture in order to pursue a certain or specific task. The task may be a new project or an entirely new firm. There is no limitation to the involvement of more than two companies at a time. Companies initiate it with the help of a contractual agreement between the parties. The profit and loss in this technique is shared with the participants. However, involving in a joint venture does not affect the individual business of the participants. Usually, many people misinterpret Joint ventures as partnerships as they have some similarities. But the concept of JV is totally different from partnerships. The main purpose of a joint venture to be formed is for a single and combined project, Whereas a partnership is an activity joined by two or more people to form a business entity. In the case of a JV, different entities can join hands together to work on a single project. In the year 2011. two major giants TOYOTA and FORD have joined together with an aim of manufacturing hybrid trucks. In a similar way, SABMiller and Molson Coors Brewing Company joined hands together to form MillerCoors whose main goal was to market their beer brand and make it famous all over the US. The dictionary meaning of the word ‘venture‘ is a hazard or a risk. However, a joint venture in business deals with risk as well as benefits. A joint venture is an enterprise that lasts for a finite time. There are several types of joint ventures, which a company can implement based on the firm. There is no fixed structure of the joint venture program. There are two major types of joint venture i.e. insider and outsider joint venture along with their variants. However, the joint venture partnership varies according to the contractor the agreement between the companies. An international joint venture is one of the most successful approaches to set up a business in foreign countries. Does the word ‘insider’ ring any bell? The word insider means someone from the organization who has an access to the confidential information of the company’s operations. Well, the term is almost similar when you include in the joint venture firm. Insider joint venture type allows joint effort of the people to focus on a single product. Each participant share an equal right, access, and contribution in operating various functions that need attention. Here the company can view any information, as it possesses equal rights. Some insider functions of joint venture include pooling the resources for efficient research and development, product examination facility, abundance space, etc. If you think that being an outsider is referred to someone who is not an insider then you are right. Outsider joint venture means the same. Each participant of the outsider joint venture enterprise takes up a function relating to the product. However, the focus of each participant is limited to the function he or she is assigned to perform. For example, a company produces a product and implements the joint venture deal in it for the promotional purpose. Both the firms are equally involved in the same product however; the functions are different. The word ‘marketing‘ is not a foreign term to you. Marketing refers to the promotional process of a certain product. In a marketing joint venture structure, two marketing companies come together to promote the product equally. A joint marketing venture can benefit in cutting down the individual cost and avails a better reach. Most of the large enterprises or firms implement this efficient technique. Benefits of a joint venture marketing include combined advertisement, co-hosting facilities for promotional seminars, etc. A joint venture is a flexible enterprise and you can choose its types, according to the requirement. The flexible nature depends and differs according to the contractual agreement between the participating organizations. Involving in a joint venture is an important decision for the organizations. Therefore, it is necessary to consider and evaluate important factors before signing a contract with another firm. Projects are performed to step up on the stair of success. However, it is important to know whether the other party is equally interested. Moreover, it is also important to ensure that the firm is certified. After all, the amount of cons and crimes in the corporate sector has increased, at a significant rate, in the past years. It is ideal to have a 50/50 profit and loss partnership. However, in the corporate world, it is important to consider the partnership layout. Either the input, assets, funds, etc should be invested equally or the profit/loss ratio should be set based on the investment. Well, a legal agreement is the most important thing that you need to consider. It should include all the rules of partnership and other functions. Thus, it is important to maintain a perfect agreement with the help of legal authority. Let us have a look at the things that one should include in the agreement. A contractual agreement is a very important part that is required to set up the joint venture enterprise. The joint venture has certain factors and possibilities that need consideration thus, it is important to include everything in a legal format. Let us have a look at the elements that are required to add into the legal document before starting the joint venture. It is very important to mention the involving parties. It is a very common fact and hardly people forget about it. However, you should include it, as it is an important element. When two parties are involved it is not a problem however if there are more than three or four parties then it is essential to mention all of them along with the firms. Any task happens for a reason. For instance, you drink water because you are thirsty. Similarly, it is important for the company to mention the objective and the reasons for which the joint firm is set. Moreover, it may be helpful while terminating the contract when the required objectives are not accomplished. As we have discussed previously that, the profit and loss partnership is considered on a 50\50 basis. However, the input and the assets matter. The profit and loss partnership depends upon the investment of each firm. Thus, mention the assets and monetary fund invested by each firm. Where two people meet, it is impossible to avoid disputes. Although you cannot ignore dispute, you can pre-arrange the resolution. Well, by involving clear clauses regarding the functions, assets, as well the rules of management, responsibilities, and processes. You may call it the start of the end. Well, termination is the last thing you look forward to, before any deal. However, it is important to include termination rules. The ‘what ifs‘ factors are the reason why termination rules are necessary. What happens when the objectives are not fulfilled? What happens when the company is suffering loss? Thus, clearing the reasons of termination rules is required. Before starting any enterprise in a combined manner, it is important to have background knowledge of the other participant. In an insider joint venture, the participants have equal right to view the confidential matters. However, to ensure that they maintain the confidentiality it is essential to include rules in the agreement. The joint venture brings along many advantages to the firm as long as the objectives are accomplished. Let us look at some of the advantages of a joint venture that are mentioned below. The joint venture is created to complete a certain task or a project. However, in a small-scale company, it is difficult to build up the machinery that the product needs. In the moment of need, the joint venture is the perfect solution. For example, if a company has a plan for the perfect product. However, due to the financial shortage, there is not enough machinery or resources available. At such a time, if another company, which is equipped, lends a hand in the form of a joint venture, then it becomes easier to produce. Moreover, if the product acquires success then both the companies can enjoy the profit. By now, flexibility is the new favorite word in the corporate sector. The corporate world always looks out for the success and benefit. The joint venture enterprise runs around the word ‘flexible’. Here, by flexibility, I mean to say is that each participant has the freedom to continue with the individual business. The joint venture participants can only interfere with the participated project. Thus, during the term of the contract, participants can freely resume their business as long as they fulfill the needs mentioned in the agreement. This is one of the benefits of joint ventures. The credential is very important in the early stage of the business. However, if you have the perfect plans of production and other resources, the joint venture can be useful. Affiliating with a well-known brand can provide a good consumer base as well as market credential and recognition. Moreover, for the other participant, this is the best way to enter into the foreign market. As some of the rules and regulation of places, prevent the foreign industries unless affiliated with the local brand. The joint venture brings along the boon of sharing. It is truly said that sharing is caring. In business, shared costs, expenses, benefits, and risks facilitate the company to flourish. Shared cost lessens the required financial burden. Moreover, the equal participation enables the company to focus on the betterment of the product. If the product receives appreciation in the market then the participants enjoy the profit. However, if the product fails to bring success then you should divide the loss according to the contract. This is one of the best joint venture benefits. An entrepreneur may acquire a qualifying degree but he also requires practical knowledge. However, practical knowledge comes with experience in any field. Thus, affiliating with a joint venture for a certain period or task gives experience and proves to be a benefiting factor for the present task. Moreover, the other party can provide a good consumer base and social contacts. There are innumerable advantages of the joint venture. However, the disadvantages also tag along in the process. Advantages may exceed the disadvantages, however; you should remember that sometimes faith and risk play the key role in the journey of success. 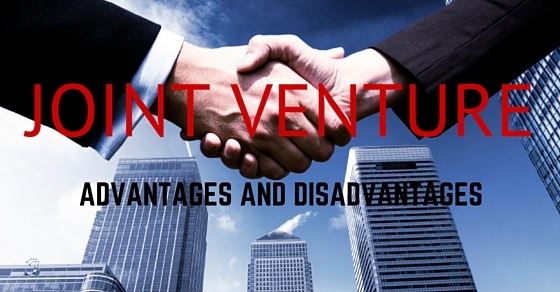 Let us look at some of the disadvantages of the joint venture that are mentioned below. Flexibility is important however, some projects require full concentration and thus the simultaneous work may become impossible. In times like such the participants need to focus on the product of the joint venture and the individual businesses suffer in the process. For example, If company A requires technological assets in joint venture then company B avails the facility. In the same time, if the company B requires those technical assets then he has to postpone the individual project for the time being. This point will clarify the need for a proper joint venture agreement. It is required to mention the assets and involvement of the participants in order to prevent claims of the other parties. Thus, it is important to abide by confidentiality and royalty rules in the contract. This will save you in the future from legal troubles. 50/50 profit is ideal but it is impossible to maintain a 50/50 contribution. Let us make it easier by a simple example. If the Company A is planning the production process, whereas Company B is responsible for the production and the Company C is responsible for planning and implementing market strategies. Company A will not be involved in the production and promotion process, as a result, the pressure will be on Company B and C. Moreover, this will affect the individual business. Disputes are one of the major problems that lead to various problems in the joint venture. In the corporate world, it is important to maintain relations. However, it is difficult to form rapport between people of a different culture as a result; it will hamper the process of the completion of the task. Thus, the joint venture brings a bit of obstacle in the form of relationship maintenance. The joint venture is a perfect strategy for the entrepreneurs. Although it helps in expanding the company in the market it also requires experience and co-operation. However, the organization should always analyze and compare the joint venture advantages and disadvantages before implementing.